This distinctive new fine writing instruments series will convince you. It is a very extraordinary gift idea for a special person or even for yourself. These colours will brighten your day! The white parts are made of high-quality resin that is first turned and then polished to a high sheen. The barrel with the white and turquoise stripes is made of cellulose acetate that was very carefully manufactured and turned into a sleeve. All rings and the typical Pelikan clip are plated with 24 carat gold. 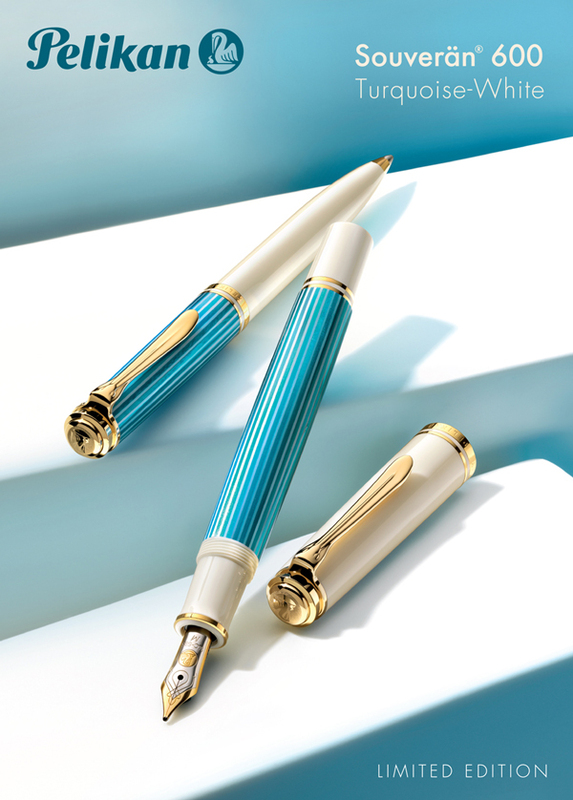 The fountain pen has a 14 carat bi-colour gold nib with rhodium trim and will be available in 4 nib widths EF, F, M and B. The matching ballpoint pen has a twist-mechanism. Every single writing instrument is mounted by hand and carefully checked to fulfil the strictest quality criteria. Pleikan Souverän 600 Turquoise-White is encased in a specially designed gift box.